Saturday: 3:00 to 3:45 PM or by appointment. Baptisms take place on the first Sunday of every month. Infants should be baptized soon (within a few weeks) after birth. In order for parents to have sufficient time to choose qualified godparents and complete the Baptism Preparation Program, an appointment should be made with Father Costa at least three months before the baby’s due date. Parents must be registered parishioners and weekly participants at Mass for at least three months. Sacramental preparation for First Holy Communion is a two-year program: Grades 1 & 2. Children from both public and Catholic schools are required to complete two years of faith formation prior to receiving First Holy Communion. Confirmation is normally conferred in Grade 9 and is two-year program (Grades 8 & 9) for both public and Catholic school students. In addition to faith formation classes, candidates in both grades are expected to complete community service and a mandatory retreat is required in the second year of preparation. 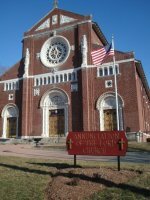 Adult Confirmation: Any parishioner (18 and older) who has been baptized, received First Communion and attends Mass here every weekend, and who would like to be confirmed should call the rectory to make an appointment to meet with Father Costa. Learn more about becoming a Catholic and/or receiving sacraments as an adult. Confirmation, together with Baptism and Eucharist, form the Sacraments of Initiation that are all intimately connected. In the Sacrament of Confirmation, the baptized person is "sealed with the gift of the Holy Spirit" and is strengthened for service to the Body of Christ. Please make an appointment with the pastor to discuss how we can help you receive these Sacraments. Adults interested in entering into full communion with the Catholic Church, or being baptized should contact Fr. Tom at the office. Classes start in the fall and continue until Easter. This sacrament is given to anyone over the age of reason who is in danger of death due to illness or old age. Because a priest is not always at the rectory, this sacrament should be requested as soon as someone's condition worsens. An annulment is a declaration by a Church tribunal that a marriage, thought to be valid according to Church law, actually fell short of at least one of the essential elements required for a binding union. The annulment process is frequently misunderstood, but with the proper explanation and help can provide healing for many. Please call the office to talk with the priest about the annulment process.